Cottage 52 is well maintained, pretty, and clean. 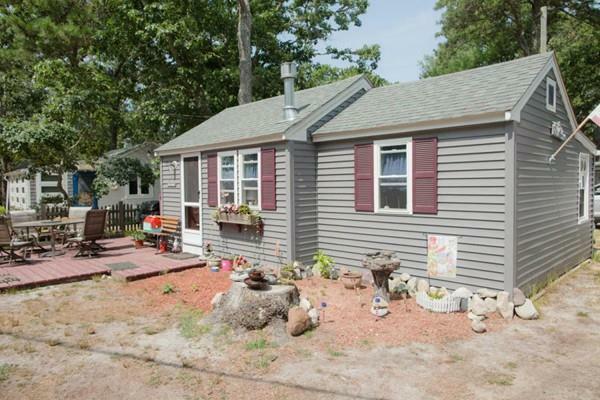 It has been recently updated and boasts wide pine floors with two bedrooms plus living area. The outside space offers a nice deck and yard. Newer roof and septic system. Empty and ready for new owners! Central location in the Village. Make lasting memories at Salt Air Village, a seaside community of freestanding condos w/deeded beach rights to Grandma's beach & use of Chase's Ocean Grove beach area too. Not leased land.Owners can have pets, & summer rentals are permitted. There is a ballfield, pretty pond, shuffleboard areas, and main house and garage for the community. Many of the owners and their families have been at the Village for decades. Now is your chance to share that experience! It is near popular Dennis Port attractions.